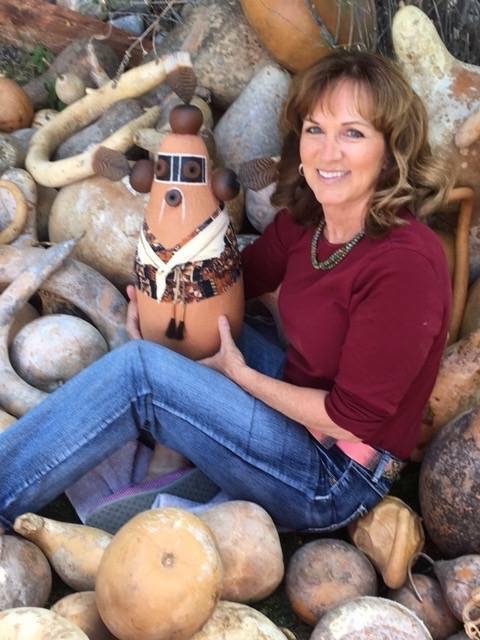 Lona Warne has 30 years of experience creating gourd art. Lona is a native of South Dakota and was exposed to art an early age, but it was after she moved to the SW that she fell in love with southwest art and culture. Lona has been studying with master gourd artist Robert Rivera for several years and as she says "At age 60, I'm finally an up-and-coming artist"
"Tawa" (Sun Spirit) Gourd Sculpture - by Lona Warne, COAWL16-07. Gourd Mask - by Lona Warne, COALW17-03. Gourd Sculpture - "Mudhead" by Lona Warne, COALW17-06. Gourd Sculpture - "Petroglyph People" by Lona Warne, COALW18-04. Gourd Wall Art - Lona Warne, COALW18-02. Wapati Gourd Figure - by Lona Warne, COAWL16-05.